What is Html.ListBoxFor Extension Methods? What is Html.ListBoxFor Extension Method? Html.ListBoxFor Extension Method creates ListBox control and allows users to select multiple options in one go. 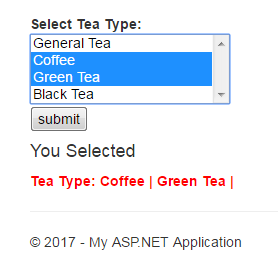 It is very useful when you want to get multiple options for the users. The benefit of using ListBoxFor is, all the options visually appear and a user has the option to select one option as well as more than one options. Here, in this tutorial, I will explain, how to create ListBox in ASP.NET MVC using List Items and then post selected items to controllers. How to Define Html.ListBoxFor input control? Here, I am going to create a TeaList and later I will use this TeaList to show in ListBox and ask the user to select their choice. Html Attributes set Html Properties for input control like width, color, value, CSS class etc. Attributes provide additional information about elements and always comes with name="value" pair. In this chapter, you learned Html.ListBoxFor() Helper Extension method in ASP.NET MVC 5 with complete programming example. I kept this chapter simple, short and easy so hopefully you will not get any problem in understanding this chapter. In the next chapter, you will learn Html.Hidden() extension method.